Born and raised in New York, Leslie Marcus continues to take her artwork to greater heights with enormous passion and sensitivity. An Ojai, California resident for over 18 years. Leslie paints in her home studio, and teaches Fine Art Painting. Riding New York City�s subways at the age of 14, Marcus studied watercolor painting at The Arts Students League. With a A.A from The California College of Arts & Crafts and B.F.A from The Academy of Art College in S.F. 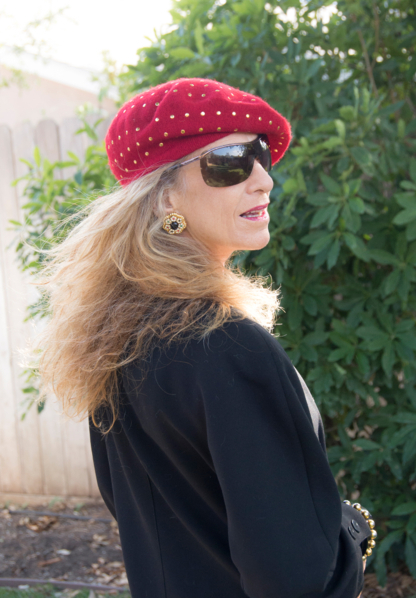 Marcus then immersed herself in the highly competitive Fashion World of Los Angeles, creating exclusive, original and exotic Textile Designs for Apparel and Home Furnishings. As an Art Educator, Leslie has taught High School and Elementary School Art Courses, and continues to offer Private & Group Painting Classes in Watercolors and Oils to youth, teens, and the elderly. Her mentoring focuses on the students� individuality and intuitive abilities. Leslie has won numerous Fine Art Achievemnt Awards; she has been selected to participate in The Healing Arts Fine Art Program and permanent collection at Santa Barbara Cottage Hosipital & Goleta Health Care Systems in California. Marcus' work has been reproduced for: Wine Labels, Greeting Cards, and Exclusive, One-Of-A-Kind, Hand Signed, Hand Embellished Fine Art Giclees. Collectors of Marcus� works reside throughout the United States, Europe and Asia. B.F.A. Design/Industry, Academy of Art College, S.F., CA. A.A. Illustration/Design, California College of Arts and Crafts, Oakland, CA. Designing Textile Prints for Apparel & Home Furnishing Manufacturers. Designer: Hand Painting & Designing Textile Apparel Prints from Concept to Completion. Designing Infant Bedding and Accessories from Concept to Completion. Painting & Drawing: Design Development; Color & Layout of Designs. Besant Hill School Ojai, CA Grades: 9- 12 Drawing, Painting, Color, Design, Composition. * SOLO EXHIBITION THE ROASTING COMPANY& GALLERY OJAI, CA. * SOLO EXHIBITION OJAI COMMUNITY BANK & GALLERY OJAI, CA. * SOLO EXHIBITION GEM QUEST JEWERLY & GALLERY OJAI, CA. * SOLO EXHIBITION BANK OF AMERICA, OJAI, CA. * ART IN THE PARK JURIED GROUP SHOW OJAI, CA.